Tamo Campos may be best known as the grandson of award-winning scientist David Suzuki. He is also, however, an accomplished snowboarder, filmmaker, and environmentalist from Vancouver, British Columbia. In 2011, Campos founded Beyond Boarding, a group of snowboarders, surfers, and artists that fights for the environment and social justice. As part of Beyond Boarding, Campos has occupied mining camps in the Sacred Headwaters of British Columbia, driven through Alberta in a vegetable oil-fueled bus, and traveled to the Amazon basin in Peru to support frontline communities. His most recent film, Northern Grease, mixes snowboarding with activism, focusing on Canada´s main contribution to climate change: the Alberta tar sands. Last year, Campos also made headlines when he was arrested for participating in a protest at Burnaby Mountain, where Kinder Morgan is working to expand the Trans Mountain pipeline. How was your nonprofit Beyond Boarding born? Beyond Boarding is a collective of snowboarders, surfers, artists, and friends. We´re basically trying to increase awareness of social and environmental justice issues within the outdoor community. It’s a fun project. We´re not all snowboarders, but we’re all engaged in becoming educated about the issues that affect us all. Photo by Howl Arts Collective The Alberta tar sands. “A lot of our projects have taken us to rural areas, where extractive industries are creating displacement, affecting water, and affecting traditional hunting grounds,” Campos says. Do you think that the snowboarding community in Canada has changed? I think that in many ways the outdoor community is starting to see the impacts of climate change. Unlike the rest of society, which is spending a lot of time indoors, our community is outside. We are seeing the shifts in weather patters. We are having shorter winters, extreme storms in eastern Canada, and melting glaciers. I think that this inevitably allows us to see climate change firsthand. And what our group asks is, how do we take that experience of seeing climate change and use our community — the outdoor sports community — to actually create a responsibility to those that are being affected on the frontlines of climate change, those who are being displaced and killed by climate change now. Has the outdoor sports community become involved? The whole idea of Beyond Boarding was, how do we remain snowboarders and surfers and still talk about the environment? We do a lot of presentations in high schools and universities. We´re not coming at it as preachy environmentalists, but coming at it as bunch of young athletes who drive around the country in a veggie oil truck. And that affects people. So it’s been really successful in that sense. A lot of our projects have taken us to rural areas, where extractive industries are creating displacement, affecting water, and affecting traditional hunting grounds. We´ve learned more than we’ve been able to teach, and our whole project has been to learn from frontline communities, and then share those stories in urban centers. What about becoming an activist? How can you empower people and make them care? If you had asked me some years ago about activism, I´d say no way. I´d be out the door if you asked me something political. But we all have experiences that change us, and mine came from my trips down to South America, seeing the affected communities there, and then coming back home and seeing Canada´s contributions to climate change with the tar sands, LNG history, and coal mining. And you have to do something when you see injustice. So that’s been my story with activism. I think activism has always been important. There’s never been a time that hasn’t been important. But I think activism in a funny word, it makes it sound like a career. I´ve never seen it like that. Environmentalism is a lens to see the world. We’re intricately connected to nature. Without mother nature — clean air and water — we wouldn’t exist. And so it doesn’t matter if you’re a minor, a teacher, or a student, environmentalism is a way of seeing the world and participating in it. My own vision of activism is that, right now, we have a very destructive economic system that is being put above the very ecology that keeps us alive. For me, activism means asking “How do we change that? How do we put the environment above this system that is destroying us?” That´s what it is, more than a career. It’s a passion. A passion for justice. What skills are useful to be an effective activist? There are so many amazing groups that pass knowledge on, pass skills on, and it’s really important that we skill up in this movement. And that we realize that there are so many different ways we can resist the system. I think what is beautiful about having a diversity of tactics is that it is the same way that things works in nature. Nature is extremely resilient because of biodiversity, and that´s how our movements should be. Whether you´re organizing a rally, contributing to education in schools, or participating in an Indigenous frontline blockade, these efforts all play a part in this movement. The more diverse we are, the more successful the movement is going to be. At what rate have the tar sands expanded? In Canada, we have one of the largest oil deposits, but it’s unconventional, meaning we need huge deposits of water and energy to extract this oil. Leading climate scientists are saying the majority of tar sands need to stay in the ground, yet our government wants to extract it all. By 2020, it’s already proposed that tar sands will emit twice as much as every car in Canada, and so I think that, more than driving less, or riding our bikes, we have to fundamentally stop the tar sands if we owe a responsibility to frontline communities around the world. How have tar sands affected local communities? The tar sands region is located in Northern Alberta. It’s in Beaver Lake Cree territory. When Canada was created, it created treaties with the First Nations groups, establishing that they are allowed to hunt, and have healthcare, and use their traditional territories. Canada has permitted extraction efforts to destroy the landscape to the point where the First Nations community can no longer fish, hunt, or subsist from the land. The Beaver Lake Cree First Nations group has sighted over 20,000 treaty violations related to tar sands development. And then there are the communities downstream from the tar sands, like in Fort Chipewyan, which suffer from very rare cancers, since the fish are being affected as well. We have to remember that the tar sands are situated beside the third largest source of freshwater in the world. That is a nonrenewable resource that we need to care for, because water is the basis for all life on earth. 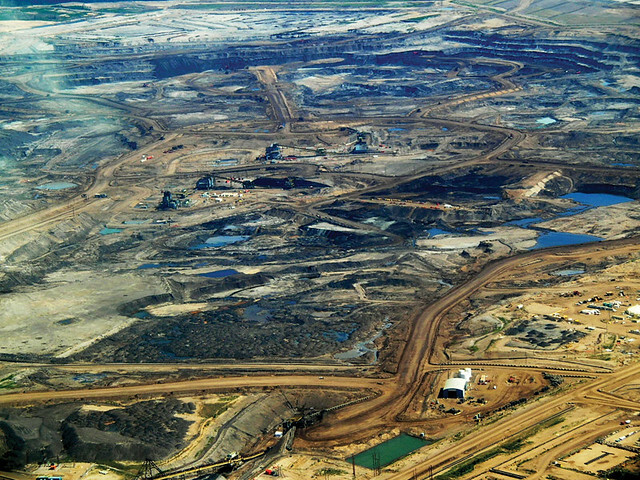 Tar sands extraction won’t expand because the industry doesn’t have access to foreign markets. Right now there are different pipeline projects proposed all over the country, but there are also a lot of local communities that are standing up to this development, saying that it’s extremely radical to be build more fossil fuel infrastructure in the midst of climate change. We´re seeing all sorts of people standing up to these pipelines, from mothers, to teachers, to indigenous activists, to students. Have you seen these tar sands up close? We personally did take a trip up to the tar sands in 2013. It was shocking — just the scale and size of it. The tar sands make up an area bigger than England. This is the biggest capital construction project in the world. Just the scars extraction efforts are leaving on mother earth are painful to see. What strategies are being used to deter these projects? Right now, there are a huge number of diverse tactics that people are using to stop the tar sands. That goes from popular education, to First Nations blockades, to legal court challenges, and I think these are all extremely valuable. I think one strategy that is making waves now is the Unist’ot’en camp, which is a camp in Wet’suwet’en territory, where a First Nations group has occupied it’s traditional territory since 2009 to stop pipeline construction. This is an area in Western British Columbia without a treaty, so it’s actually unceded land, but the Wet’suwet’en haven’t allowed pipeline companies onto their territory for six years now. They have built a solar powered house, a permaculture garden, and a healing center on the actual pipeline routes. And we have to remember that this isn’t a protest camp, this is indigenous community activism. The Wet’suwet’en are acting on their responsibility to the land, and it is time for the Canadian government to respect that. What arguments are you using on the alternatives to tar sands? I think right now we’re feeding a dying beast. It’s time to invest in renewable energy. It´s time to create a sustainable economy, one that doesn’t heat up the very things that keep us alive. The question is, how do we create energy where the local communities actually own it? Instead of multinationals coming in, extracting the tar sands for capital that leaves the country, how can local communities empower themselves and own their own energy? Who is speaking for indigenous rights now? In Canada you have a very interesting situation where indigenous rights are included in our constitution in section 35b, yet they are not respected by the federal government. At the same time, Indigenous communities are winning supreme court cases, yet they are still not being respected by our state. So I think it’s a human rights issue. It is important to understand that injustice against Indigenous communities is the foundational injustice that allowed the nation of Canada to be created. I think it’s time we break ourselves out of this continuous colonial mentality, and start reconciling, respecting the treaties that allowed this nation to be formed, and creating a new relationship with First Nations groups. In honoring those traditional rights, everyone is benefited. There is no harm in breaking injustices. What are the current environmental movements going on in Vancouver? There´s a ton going on in Vancouver. From permaculture projects, to green building design, to anti-pipeline work. It´s a growing movement and people are starting to realize there’s an alternative world we can create. What would you say to climate change deniers? There is not a single peer reviewed document that says climate change is not human caused. Yet somehow in the media it’s this 50-50 conversation. That shows how much investment the fossil fuel industry has put into climate denial, by creating institutions such as the Frasier Institute, to put out petitions and reports to make it seem like climate change isn’t real. But unanimously scientists have said climate change is real. We should have been working on climate change 20 years ago, but it has been debated during my entire life. A lot of arguments are used like, ¨If you drive a car, you can’t be against this pipeline,¨ or ¨If you fly a plane, you can’t be against this pipeline.¨ Well, this turns out to be the same exact argument used during the slavery years. During the anti-slavery movement, slave owners would put out newspaper advertisements that said: ¨If you put sugar in your tea, then you can’t be against slavery.¨ Imagine if we had listened to that. What do you think is at the core of the current environmental crisis? I think environmentalism doesn’t live alone. When you think about climate justice, it gets heavy because it lives alongside so many other injustices. That’s the key. Perhaps the roots of the environmental crisis are racism, colonialism, and capitalism. Capitalism allows there to be infinite growth on a finite planet. Racism is what allows frontline communities in the tar sands to observe 20,000 treaty violations, without getting attention on the front pages of the newspaper. And colonialism takes away from communities that have been here the longest the right to say “no.” Whether that’s the right to say “no” to settlements, “no” to having their kids taken to residential schools, or “no” to pipelines. So when we actually fight these projects, we aren’t just fighting a pipeline, a coalmine, or a hydroelectric plant. We´re actually fighting systems. When we base our activism on de-colonial, ant-capitalist, and anti-racist foundations, that’s when we´ll actually see long-term solutions to the very oppressive systems that allows us to destroy the environment in the first place. What direction do you think we should be moving toward? I think it’s all about your point of reference. Right now, how do we define happiness? How do we define health living? Well, one of the main meters used to define progress is GDP, but that just accounts for transactions involving money. So when there is an oil spill, destroying tons of fish in the oceans that people live off of, well that actually increases GDP because more capital is put into cleaning up the oil spill. Or for example, if I´m too busy to take care of my kids, then I pay someone else, a babysitter, and that also augments GDP. But is this creating a healthy society? We have to have this conversation. Is consumerism really making us happy? And how important is the role of youth? I think youth is everything. In our current economic system, youth don’t have a voice. I mean, you can’t vote until you´re eighteen. So no politician will mandate a world for youth. It’s important that we change that structure, and that’s one of the ways we can get out of this short-term thinking. Are you hopeful? Do you think activism is having an effect? If I wasn’t hopeful I don’t think I´d be doing what I´m doing. Activism and social movements have played a huge role in the world we live in now — take the anti-slavery movement and the anti-apartheid movement. Social movements have changed history. And that makes me incredibly hopeful, because that what is going to save us moving forward.